Which box / paper / envelope should you choose? Depending upon what item you are looking to store, you will need to select the correct type of storage enclosure whether it be a box, envelope or interleaving material. You will see the terms 'Buffered' and 'Unbuffered' around our site to help inform your storage decision. So what is the buffer in paper and board? Calcium carbonate (chalk) is often added to paper pulp during the paper making process as a buffering agent – or ‘buffer’. This buffering agent raises the pH level of the paper to the alkaline side of the scale. There are various methods of measuring pH levels, one of the simplest is the pH testing pen, or for more accuracy the digital pH meter is available. The addition of 3% calcium carbonate provides a pH of approximately 8.5 in paper, making it non-acidic. The reserve of calcium carbonate also helps neutralise other acids in the environment that would normally make any paper become acidic over time. Acids can migrate from neighbouring boxes, shelving, items within the enclosure, or even the atmosphere. So should you choose a ‘buffered’ box or paper? Most items in storage, especially in the collectibles arena, would benefit from storage in a buffered enclosure. This is especially true for the vast majority of paper and cellulose based items. Because of its ability to neutralise acids and extend the life of paper, photographs, textiles, and artefacts, buffering is more often than not a benefit in interleaving tissue, storage boxes, folders, envelopes and other paper enclosures. For most photographic materials, including black and white prints, colour prints, and albumen prints, either buffered or unbuffered enclosures are satisfactory – the PAT test is a separate test which evaluates a storage material’s properties when storing photographic materials. There are some exceptions and we would always recommend that if there is any doubt that you should contact a trained conservator. OK, so buffered sounds suitable for most things, why choose ‘Unbuffered’? The concern over buffering comes from the inclusion of protein-based materials in buffered enclosures. It is generally believed that materials that come from animals should be stored in unbuffered enclosures, or at least should not come in contact with buffered materials, this is due to the proteins which provide the item’s structure. These items include silk, wool, leather, feathers, animal specimens, horsehair, pearls etc. Blueprints and cyanotype prints should also be stored in unbuffered enclosures to prevent fading. 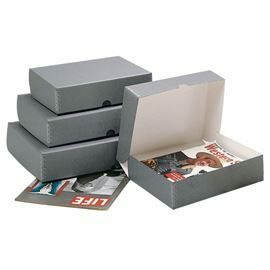 As mentioned above, most photographic materials are OK to be stored in buffered enclosures, some would recommend albumen prints are stored in an ‘Unbuffered’ enclosure, our Perma Dur storage envelopes are popular for this application.